An array of colour, shapes and height for 5 months long. All bulbs will naturalise - coming back every year. Planting depths and spacings included on packets. Transform your garden this summer with this simply brilliant collection of summer-flowering bulbs. Youll be amazed by the dazzling array of colours and variety of shapes for 5 whole months of summer! From tall spires of Gladioli, to pretty, disc-shaped Anemones, in multi-coloured vivid shades they are all sure-fire winners! They are perfect for patio containers and flower borders and best of all, each of these items will naturalise, so youll potentially get bigger and better displays each year for many years to come! 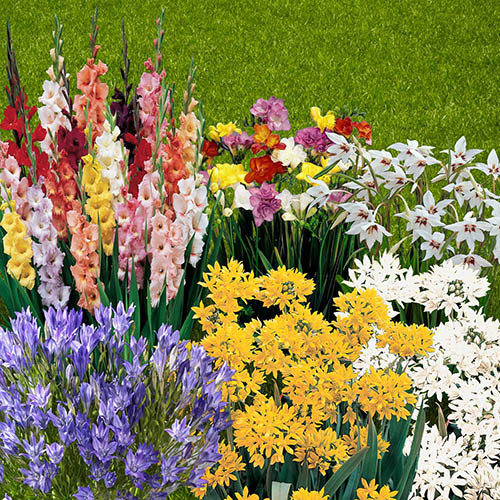 All of these bulbs will flower from this summer, so youll get a minimum of 300 stems of vivid colour this season! 20 Gladioli Mixed Colours: Tall spires of multi-coloured flowers, perfect to cut for your home or brighten your garden. Extremely easy and low maintenance, and yet very rewarding. 55 Brodiaea Mixed Colours: Clusters of attractive bell shaped blooms which make ideal bedding plants equally well suited to patio tubs and pots. 50 Liatris spicata: Tall magenta-purple flower spikes appear from mid summer. Superb in the border and lovely in a vase. 55 Oxalis: A stunning ornamental lucky clover with four leaves and pretty flowers. Excellent in containers and front of borders. 50 Sparaxis Mixed Colours: Perfect for adding vivid colour to your garden and make excellent cut flowers. If you want to store your bulbs over winter, then lift them before the first frost. Bulbs generally prefer to be stored dry. Remove loose soil, carefully pull or cut off dead and dying leaves and leave to dry overnight. Dusting with fungicide will help keep the bulbs healthy. Summer bulbs should be planted in spring, when the soil is beginning to warm up and directly after purchase. Your bulbs will enjoy a warm, sunny position, in fertile, free-draining soil. Heavy, clay soil can be improved by digging in 1-2 buckets of coarse sand per square metre. To plant, dig individual holes for each bulb or a trench if you're planting in groups. Place bulbs in the holes without pushing down hard. Make sure the growing point is pointing upwards, then cover with soil. Use the bulb as a guide and plant it two or three times its depth. Space them approximately two to three bulb widths apart. Many summer bulbs are ideal for growing in patio containers, especially the more tender species, which can then be stored over winter. Store the bulbs in dry paper bags or trays of almost dry sand in a frost-free place.